Stories of Eva and her friends are Judi Curtin’s second major series. Readers may also be familiar with her Alice and Megan books which have won her many young fans. It’s tempting to describe Curtin as the Irish Jacqueline Wilson, as they cover much of the same territory. Like Wilson, Curtin writes about girls, friendships and families. She puts her characters in situations that will gently test them, and subtly provide her readers with notes on their own lives. Her plots might be less gritty than Jacqueline Wilson’s, but she’s still dealing with some of the really important things: how friendships work, how families are always a work in progress. Eva is an engaging heroine, optimistic, impulsive, ready to give things a go, and to acknowledge her own imperfections! This book is a diary story with a twist. 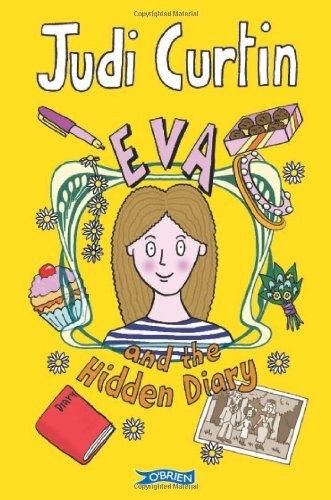 Eva and her friend Kate are clearing out long forgotten junk from the shed in Eva’s holiday home when the find an old diary written by a girl of their own age but a long time ago. Eva can’t resist reading it – to Kate’s horror – but the story it tells is a very sad one. Daisy, the diary’s author, describes how her family is broken up when her father is accused of stealing a chalice from the local church and imprisoned for it. This is a grown up story of pain, prejudice, people doing bad things for reasons of love and desperation. Eva determines to find out what really happened, and together she and Kate do discover the truth, right past wrongs as much as they can be, and bring about a happy ending. The gently emphasised message being that forgiveness is all. It’s very readable, with lots of drama, and an entertaining sub-plot in which a couple of girls who’ve been bullying Kate get their come-uppance. I’d guarantee that girls who read it will be hunting out Judi Curtin’s other books when they put it down.